Sunday December 7th 1924 Went to S S and church with Ott. After dinner looked over the papers and took a short ride with the folks. Read in the evening. 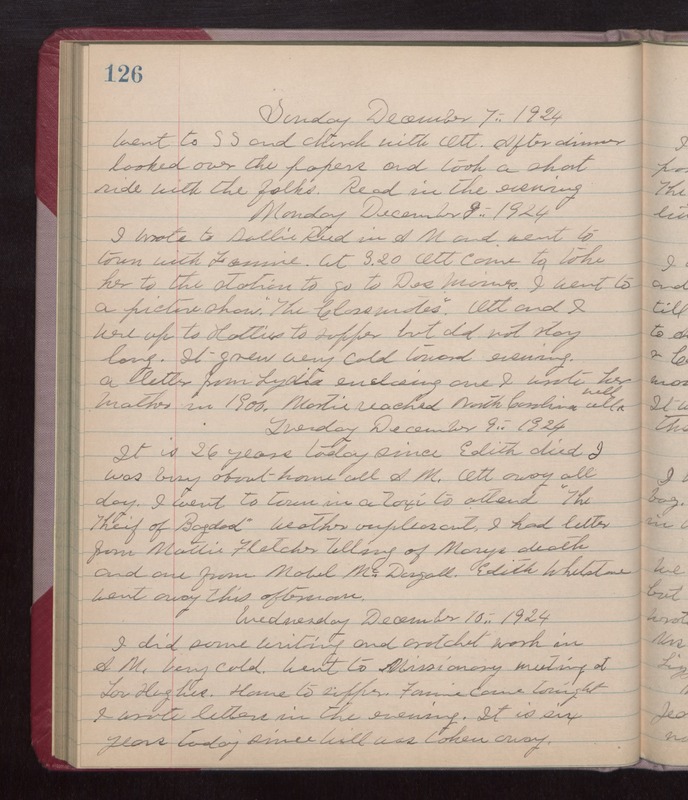 Monday December 8th 1924 I wrote to Sallie Reed in AM and went to town with Fannie. At 3.20 Ott came to take her to the station to go to Des Moines. I went to a picture show "The Classmates." Ott and I were up to Hatties to supper but did not stay long. It grew very cold toward evening. A letter from Lydia enclosing one I wrote her Mother in 1900. Martie reached North Carolina all well. Tuesday December 9th 1924 It is 26 years today since Edith died. I was busy about house all AM. Ott away all day. I went to town in a taxi to attend "The Theif of Bagdad." weather unpleasant. I had letter from Mattie Fletcher telling of Marys death and one from Mable McDougall. Edith Whetstone went away this afternoon. Wednesday December 10th 1924 I did some writing and crotchet work in AM. Very cold. Went to Missionary meeting at Lou Hughes. Home to supper. Fannie came tonight. I wrote letters in the evening. It is six years today since Will was taken away.